Needle Weaving is a thread structure that screens or creates a mesh across fabric. A “loose weaving” of thread appears as a grid pattern to emulated window panes, tile, or even cobble stones. 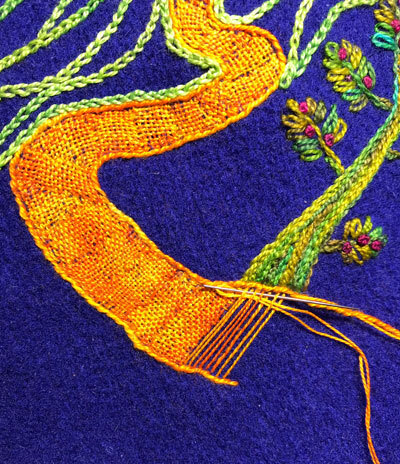 A “tight weaving” of thread conceals the background fabric completely. It sits on the surface as bold texture. 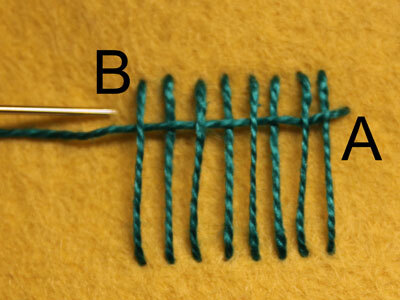 Here’s how to make Needle Weaving: Make a row of vertical straight stitches measuring about 3/4″ long from left to right on the fabric. Space them about 1/8″ apart. These are the “warp” threads. Bring the needle and thread up at A to the right and about 1/8’’ down from the top of the last warp thread. Use the blunt end of the needle and weave over and under and over and under across the warp threads. Draw the needle and thread through the warp threads. 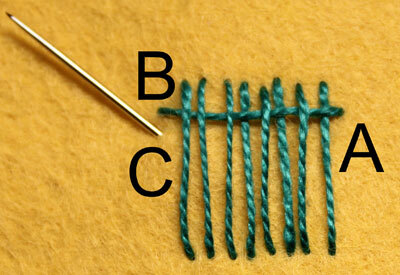 This is the “weft” thread. Insert the needle at point B (about 1/8’’ down from the top of the last warp thread) and draw the needle and thread through the fabric. Bring the needle and thread up at point C, about 1/8″ down from point B. Weave over and under the opposite warp threads from the previously woven weft thread. Use the needle to tamp down the previous warp thread and draw the thread through the warp threads. 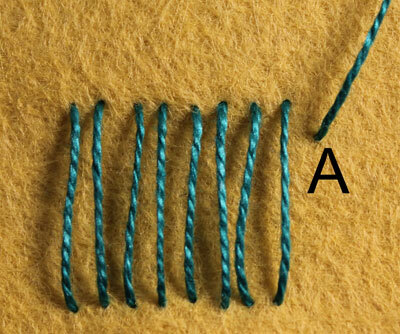 Insert the needle tip at a point about 1/8″ down from point A and draw the thread through the fabric. Continue to weave back and forth across the warp until you reach the base of the warp threads. As you can see Needle Weaving combines 2 art forms: the embroidery stitch and weaving. That must make it a “cross over” art form.